As of today most banks like SBI, ICICI Bank, Union Bank of India, Punjab National Bank (PNB) offer 3.5% interest on their saving bank account. This all started with SBI slashing interest rates on savings account to 3.5% on July 31, 2017 for balance less than Rs 50 Lakh. Reserve Bank of India (RBI) had deregulated the interest rate offered on Savings Account by banks in October 2011. It was expected then that a lot of banks would compete for this and offer competitive rates. But unfortunately there were just handful banks which offered higher interest rates while now every bank is ready to reduce the rates below 4%. The highest Saving Account interest rate is being offered by digibank by DBS at 7% for balance between Rs 1 to 2 lakh and IDFC Bank for more than Rs 2 Lakh balance. Other than this only following 5 banks offer higher than 3.5% interest rate: Bandhan Bank, Kotak Mahindra Bank, Lakshmi Vilas Bank, Ratnakar Bank and Yes Bank. The good news is most new age Small Finance Banks offer interest rate of 4% or higher on their savings account. 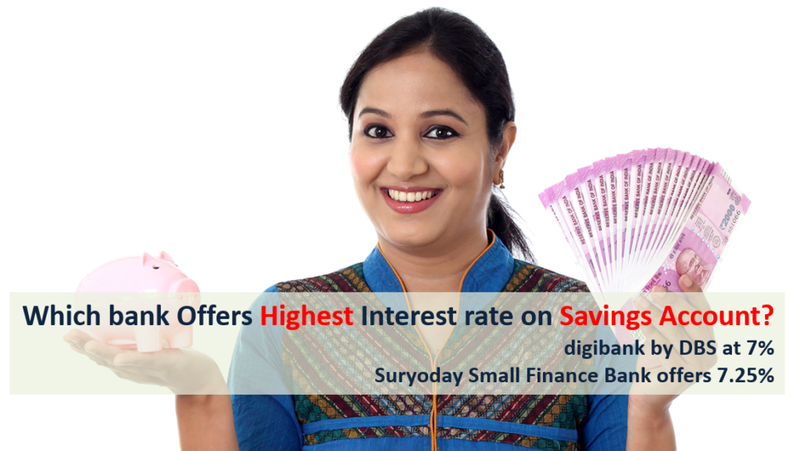 Suryoday Small Finance Bank offers 7.25% for balance between Rs 1 to 10 Lakh. Similarly Fincare Small Finance Bank offers 7% interest for balance of more than Rs 1 Lakh. The interest is generally paid at every calendar quarter on 30th June, 30th September, 31st December and 31st March. Interest is calculated on daily basis, basis the end of day ledger balance in the account. Additional Interest: If you keep 1 Lakh in your savings account, at 4% you would get Rs 333.33 as interest per month while with 7% you would get Rs 583.33. So you would earn additional Rs. 250 per lakh per month. Tax Efficient: Also in Budget 2012 Finance Minister had exempted interest income up to Rs 10,000 from Savings Account every financial year under section 80TTA. So there would be situations where people in higher tax bracket would be better off by putting money in Savings Account than doing Fixed Deposit. Budget 2018 introduced a new Section 80TTB. According to this Senior citizen can claim tax exemption up to Rs 50,000 on interest income from bank/ post office fixed deposit, recurring deposit or savings account. Should You Get New bank Account? The next question is should you go to these banks to get benefit of enhanced interest rates on savings account? 1. How much money do you keep in your savings bank account? If you are someone who has a large balance in savings account you might want to opt for accounts offering higher interest rates. For everyone with not very significant balance an additional account does not make sense. 2. Do you want to pay charges associated with the new savings account? Even if you have higher balance in your account, do you want to get an additional account and keep a track of all the new charges banks impose on accounts. Also you’ll need to maintain minimum balance. If you are in 30% tax bracket then it makes sense to have some money in savings account yielding higher interest rates than rush for short term Fixed Deposit. Most banks offer sweep in facility where the amount in excess of pre specified automatically goes into fixed deposit. So you might take advantage of the same rather than going for a new account. But remember the interest earned in sweep in account is fully taxable as your interest income from fixed deposit. Utkarsh Small Finance Bank is offering 7% interest rate on savings bank account across all segments. Excellent ! Some banks are offering good interest rates on saving accounts. Very helpful article. Hi Amit, Very nice blog! Hat off to you for your efforts you put in preparing this long list. All banks interest rate are same below 4% below 1 lac deposit. DBS bank not available in all cities. I think sbi mod is best choice to invest money and get 6% interest.